This stuffing is made with French Bread, chestnuts, and sausage. 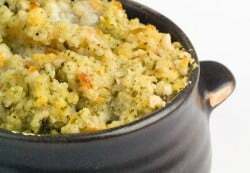 The French bread gives this stuffing a wonderful texture. This recipe comes from Stanford Court Hotel in San Francisco. Stanford Court Hotel Chestnut & Sausage Dressing is a great dressing for the holidays. Tear bread into small chunks, spread out on a baking dish, and let dry overnight. Preheat an oven to 375 degrees and butter a 9 x 13-inch baking dish. In a skillet over medium heat, melt the butter. Add the onion, and celery, and saute, stirring occasionally, until translucent, 2 to 3 minutes; do not brown. Remove with a slotted spoon and reserve. In the same pan, saute the sausage and beef, stirring and mashing with a fork, until crumbled and cooked through about 10 minutes. Drain off fat. Place the bread chunks in a large bowl and while tossing, gradually add the milk. Let stand, stirring occasionally, until the milk is absorbed and the bread is evenly moistened 6 to 8 minutes. Add the onion and celery, meat mixture, chestnuts, and parsley. Season with salt and pepper, add the thyme, if desired, and mix well. Transfer dressing to a baking dish and bake, until browned and crispy. Hello Stephanie…. great site with great recipes! Can you tell me if the chestnuts that you are using in this recipe are the simple white ones usually found in the asian section of the grocery store or the expensive imported and roasted ones from France? A roll of Jimmy Dean sausage would be fine. Link sausage wouldn’t be ideal.